Anon. sale, Hôtel Drouot, Paris, 8 June 1964, lot 161. Alexander Kahan Fine Arts, Ltd., New York. Meserve Coale Gallery, Greenwich, Connecticut. This painting is accompanied by a photo-certificate from Louis-Andre Valtat confirming its inclusion in the forthcoming Catalogue Raisonné. New York, Hammer Galleries, 19th & 20th Century European Paintings: Recent Acquisitions, November 1996, p. 11 (illustrated in color; dated circa 1930 and titled Fleurs). Louis Valtat was a French painter associated with the Fauves, and is noted as a key link that accounts for the stylistic transition in painting from Monet to Matisse. Valtat was born on August 8, 1869 in Dieppe to a wealthy family of ship owners. He spent many of his childhood years in Versailles, a suburb of Paris, where he attended secondary school at the Lycée Hoche (near the Palace of Versailles). 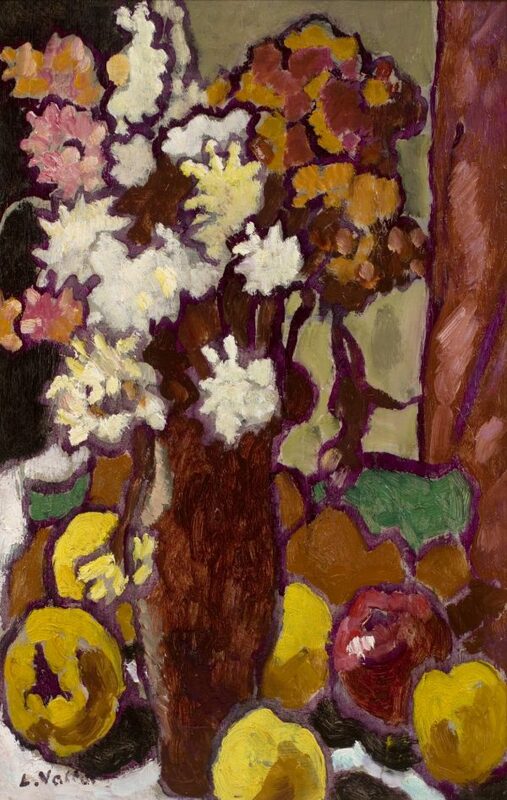 Encouraged by his father, an amateur landscape painter himself, Valtat became interested in art. At the age of 17, he decided to pursue an artistic career, and applied to the School of Fine Arts in Paris. After being accepted in 1887, Valtat moved to Paris, where he studied with the well-known academic artists Gustave Boulanger, Jules Lefebvre, and later with Benjamin Constant. After the School of Fine Arts, Valtat studied at the Académie Julian under Jules Dupré, a landscape painter of the Barbizon school. Among his fellow students were Albert André, who became a close friend, as well as Maurice Denis, Pierre Bonnard, and Edouard Vuillard, who, at that time, were members of the Nabis movement. Calling themselves ‘Nabis’ (after the Hebrew word meaning prophets), they were influenced by Paul Gauguin’s Synthetist method of painting based on the use of simple forms/lines, pure colors, and large patterns. While Valtat remained detached from that movement, he learned the Gauguin method of painting which would influence his later works. Paris theater ‘L’Oeuvre’ at the request of Lugné Poë. During 1895, Valtat painted several works which can now be thought of as Fauvist in approach, despite pre-dating the movement by a decade. At around this time, Renoir’s admiration of his work led to Ambroise Vollard making an agreement with Valtat to buy almost his whole production for the next ten years. him, and he began to express his Fauvist tendencies, particularly in painting seascapes and still life. Whether his painting ever became purely Fauvist in approach is open to question, as although he shared many of the group’s ideas, and took part in the exhibition in which the group earned its name, he was less violent in his approach to colour. In 1914, Louis Valtat stopped travelling to the coast. In 1924, after 10 years of being deprived the pleasure of a garden, he bought a house in Choisel, a small village in the Chevreuse valley, and spent much of the year there. His garden as well as the flowers and fruits that he grew became his favorite themes for his paintings. He was made Chevalier de la Légion d’honneur in 1927, and six of his paintings were shown at the 1951 exhibition on Fauvism, which took place in Paris.